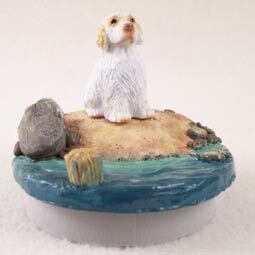 Home > Dogs All > Clumber Spaniel > Clumber SpanielCandle Topper Tiny One "A Day on the Beach"
The Clumber Spaniel is one of the original nine breeds registered by the AKC. Their exact origin is still not exactly known, but most people believe they originated in the 18th century, in France, and were named after Clumber park of that region. Described as a “dignified buffoon” this breed loves children, and while they were designed to hunt, by going THRU the brush instead of over it, they are also accomplished water dogs. Clumbers do shed year round and also tend to slobber and drool, but they are intelligent and independent thinkers that respond best to positive training. The AKC recognized the Clumber Spaniel in the Sporting Group in 1884. They range in size from 17 to 20 inches tall at the withers and weigh 55 to 85 pounds.